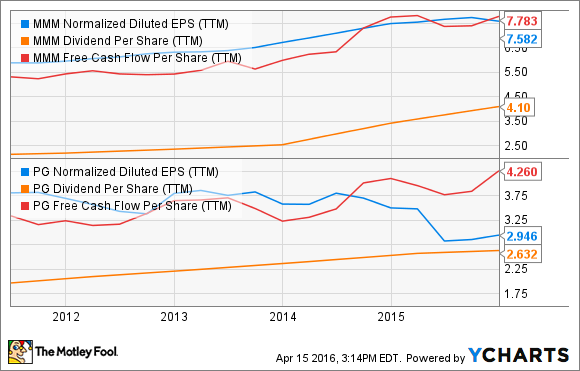 On the hunt for a stock that has a big dividend yield? Our contributors think you should give these names a closer look. PHOTO CREDIT SIMON CUNNINGHAM ON FLICKR. Many income-focused investors look to the consumer-staples sector for ideas, since its products tend to be in demand regardless of economic factors. One of the most popular dividend-paying stocks from the sector is Procter & Gamble (NYSE:PG), which has a storied history of showering its investors with dividends in both good times and bad. However, while Procter & Gamble's dividend yield is a strong 3.3%, we Fools think there are several stocks worth buying right now that offer up a higher payout. We asked our team of Motley Fool contributors to scour the investing landscape and highlight a stock that has a bigger dividend than Procter & Gamble. Read on for their answers. Andres Cardenal: AT&T (NYSE:T) operates in a challenging industry. Most telecom operators are having a hard time trying to find new growth opportunities, and pricing competition among the leading industry players is putting downward pressure on profit margins. On the other hand, being a stable and mature company, the business produces huge sums of cash on a recurrent basis, a key advantage to consider when searching for the best dividend stocks. AT&T generated $35.9 billion in operating cash flow during 2015, and the company allocated nearly $20 billion to capital expenditures over the year, leaving $15.9 billion in free cash flow to reward investors with dividends, among other possible uses. Dividend payments over 2015 amounted to $10.2 billion, or 64% of free cash flow during the year, so AT&T has the financial strength to sustain dividend payments going forward. PHOTO CREDIT: UNSPLASH ON PIXABAY. Importantly, management believes the company is well on track to producing more than enough cash to cover financial needs, reinvestments, and dividends in the coming years. In the words of senior EVP and CFO John J. Stephens, during AT&T's earnings conference call: "We're proud of our ability to generate cash. This gives us the financial strength to invest in our business, reduce debt, and return substantial value to our shareholders." AT&T has an impressive track record of dividend growth over the long term. The company has raised dividends every year since 1984, accumulating 32 consecutive years of consistent dividend growth under all kinds of economic scenarios. At current prices, AT&T stock is paying a succulent dividend yield of nearly 5%. Neha Chamaria: I love diversified companies when it comes to dividends. Diversity averages out fluctuations and risks across industries to a huge extent, saving a company's top and bottom lines from wild swings. Case in point: 3M (NYSE:MMM). You may recognize 3M for its Scotch tape and Post-it Notes, but its wide range of products serve nearly every key sector you can think of, be it healthcare, automotive, oil and gas, aerospace, manufacturing, or electronics. Not surprisingly, the conglomerate has grown its net income and free cash flow by 44% and 94%, respectively, during the past decade and has raised its dividend for 57 consecutive years. If you're wondering whether 3M can continue its winning dividend streak, you needn't worry. The company is currently paying out only about half its profits and free cash flow in dividends. Comparatively, Procter & Gamble is paying out nearly 88% of its profits and 62% of its free cash flow. In other words, 3M has enough room to increase its dividends in the years to come without jeopardizing its interest payments or growth initiatives. In fact, debt and interest burden shouldn't be a concern at all for 3M in the near future, given its whopping interest coverage of 47, meaning the company's earnings can currently cover its interest payments 47 times over. As for profits, 3M projects its earnings per share to grow between 8% and 11% through 2020. Procter & Gamble doesn't have a similar vision to offer, so you may safely expect fatter paychecks from 3M going forward. Tyler Crowe: Nowadays, there are plenty of companies in the energy space that have dividend yields higher than Procter & Gamble. The problem is finding one that has a higher yield and isn't at risk of having its dividend cut. In that case, it really narrows things down a bit. If you want both a higher yield and some reassurance that it isn't a high-yield trap, then you should look at Magellan Midstream Partners (NYSE:MMP) and its 4.78% yield. The reason Magellan's payout looks sustainable is the company's business model. A vast majority of the company's pipeline and transportation infrastructure is dedicated to refined petroleum products such as gasoline and diesel, two products that have pretty inelastic demand. Also, most of its revenue is from fee-based contracts that largely insulate it from commodity prices. In fact, a large percentage of the company's pipelines are regulated much like a utility because of a lack of competition. But the real differentiator for Magellan is the conservative manner in which management has manged its growth and payout to shareholders. Unlike other pipeline operators that binged on debt recently and paid out all cash inflows to shareholders, Magellan has kept a more modest debt profile to secure an investment-grade rating while retaining high levels of cash to pay for growth projects. Magellan may not have as high of a yield as other companies in the energy space, but the chances of a cut are very low. That's what matters when it comes to dividend investing. Brian Feroldi: If big dividends are what you're after, I'd suggest taking a closer look at the energy sector, which is littered with companies that offer huge yields. One interesting choice is Oneok (NYSE:OKE), the general partner of Oneok Partners (NYSE:OKS). Oneok holds a 41% ownership position in Oneok Partners, itself a master limited partnership primarily focused on gathering, treating, transporting, and processing natural gas. The collapse in commodity prices has put Oneok Partners' business under a lot of pressure, which in turn has caused shares of both companies to plunge. As a result, the yields on both stocks have skyrocketed. Oneok's yield is currently north of 8%, while Oneok Partners tops 10%. Of course, a high yield is tempting only if the company can afford to continue to pay it, which is why Oneok has taken a number of actions recently to ensure that will happen. Over the past year it has renegotiated many of its contracts so that it has much less commodity price exposure. In fact, in 2016, more than 85% of its profits are expected to come from fee-based activities, which don't fluctuate with energy prices. That's up sharply from 66% in 2014. Moves like this helped Oneok Partners to stabilize its business, and its distribution coverage ratio stood at 1.03 in the fourth quarter, up from only 0.60 in the first quarter. PHOTO CREDIT ROBZOR ON PIXABAY. You might be tempted to invest in Oneok Partners because of its higher dividend yield, but I think Oneok is the better buy because of its incentive distribution rights. Those rights entitle Oneok to receive an increasing share of Oneok Partners' profits after certain distribution milestones are reached, which should allow it to grow its profits and dividends far more quickly that Oneok Partners does once commodity prices recover. That gives investors a chance to capture big capital gains growth in addition to a big yield. To be clear, Oneok stock is far from a risk-free investment, given that the energy sector is rife with uncertainty. However, I think Oneok stock is trading at a compelling enough valuation and offers a high enough dividend yield that any investor brave enough buy shares is being well compensated for the risk.